I've been working on some new material this past month, as Escape Mechanism. The past four episodes (today's episode included) were produced at once, a month ago, to give me some time to focus on it. I'm barely meeting the deadline as it is, and now I've got to produce a new episode for next week. ...No, I'm not expecting anyone to care, but I can complain anyway, can't I? I do work nearly full time, after all, at a "day job" which happens to be a night job, but it's all the same. Anyway, I guess the point was - in spite of having completed the last four episodes en masse, I'm really quite proud of the mixes, especially in these last two episodes. I hope you're able to check them out. Diversity, being the key. Something I've really been focusing on this year. Nothing much new to report, except that I'm trying to stay on top of the blog, while really looking into podcasting. You may be surprised to find that the host/producer behind a show like Some Assembly Required is actually something of a techno-phobe, and so while I've been absorbing a lot of data these past few weeks, in the hopes of starting a podcast in the new year, I'm actually reeling at all the information, so much of which is quite tech-specific (meaning: I don't get it). I'll figure it out. If anyone cares. In the meantime, check out this week's episode, and look forward to a full length interview with Jason Forrest, whose SAR interview has been getting the finishing touch for awhile now. Its set to air soon. I've been getting a lot more phone calls and emails than usual, which is nice. Although, of course, the feedback hasn't been ALL positive. In among the kudos are the occasional, 'hey, I love the tape cut-ups but hate the turntablism,' or 'love the turntablism but hate the mashups,' or 'love the mashups, but hate the...'. You get the idea. The show is pretty broad in its focus, after you jump the initial hurdle anyway. While the main rule can be a pretty challenging limitation to have for a radio show (that it has to be a primarily sample-based composition, to be aired on Some Assembly Required), the fact is that’s pretty much the only rule. It’s difficult to program a show with such a limiting precept, but the fact is there aren’t too many further limitations, beyond that - meaning I can play anything from any genre (as long as it follows that first rule). Anyway, most of the criticism has been pretty constructive. Even if I disagree with what the caller/emailer is saying, I can at least listen to and understand where they're coming from; and it’s often educational. Except for the phone call I got today: My first "F" you phone call (I'll keep this clean, for the kids...). Someone called, in direct response to "Bandscan of Terror" by Department of Corrections (nice job guys! ), which was, I'll admit, a pretty inflamatory anti-GWBush cut-up, and shouted, from what I can remember (but this was it in a nutshell), "I don't have a microphone (and a radio show) to express my opinion, so I'm just calling to say "F-YOU!" I was going to go on a rant about how the caller should have realized that his response wasn't going to change my opinion on anything - and how in fact, if anything, such a hateful response would more than likely reinforce it, but then I realized the irony -- as pieces like the one I played today are probably (one would assume) created with the hope of changing opinions as well, and yet fail (largely) for the same reason. Furiously anti-Bush sound collages are not going to make a dent when it comes to convincing those who voted for him that they should have done otherwise - all they accomplish, in regards to that demographic, is the same thing this irate caller did for me: re-establish the "fact" that those on the "other side" are completely out of touch. It's fun to make fun of Bush. Let's face it - it's easy. Like shooting fish in a barrel. But even a large percentage of those who voted for him will laugh at the jokes. So, beyond preaching to the choir (which is, obviously, extremely gratifying), what's the objective? The fact is - that caller had an interesting point. The far right isn't listening to the 5 1/2 minute collage about what an idiot Bush is, anymore than they're listening to anyone else not speaking their language. And in the long run, are we hurting the cause more than helping, when we repeatedly bash the establishment on that level? It's just a thought. I know, a lot of listeners to the show are going to be irritated by how serious I'm being about this. And when you look at it from the artistic perspective - so what? Its amusing. Its creative. It makes a point. So, just play it and quit your philosophizing, right? Well, no. I believe we should live thoughtfully (and deliberately), so I'm forced to think about things like this. Actually, this reminds me a lot of the kinds of questions I started to ask myself toward the end of my short lived 'punk phase' - and you can bet I was a particularly self-righteous punk - alienating way more people than I ever positively influenced (which was one of the goals, at least by my interpretation, of being punk). What I really started to wonder then, was how in the world is any of this nonsense actually changing the world in any positive way? Because beyond the creative side, which is often brilliant, sometimes obvious (and occasionally hilarious) - what real difference are we making? ...I started writing this last week, but never posted it. It bothered me how seriously I was taking the whole subject (yes, even after I defended myself for doing just that). So, I let it sit awhile. I was wondering if I really could play any more of the political sound collage, based on my own, oh-so-sober conclusions. What I’ve decided since then, is to put the focus on the show, rather than the politics, and to hope that we’re all (liberal and conservative) rational enough to just take it all with a grain of salt - and of course I’m going to keep playing it. The whole point is to play creative examples of appropriation across all genres - including policital cut-ups. Besides - this is an art show. It’s entertainment. If I worry too much about the far reaching impact of every single sample, then I’ll be limiting the show even further than it was to begin with. I couldn’t play anything, if I really thought about all the people who might potentially be offended. The piece was witty, and creatively assembled. So, I’m going to argue that, in addition to being a political statement, it was also a fine bit of comedy. And we need to laugh even more than ever these days. It’s true we need to be aware of the impact we’re having on our culture, but its also true that we need to step away from it every once in awhile, and laugh. And with that, I’m choosing to move on… (cue: sound of soapbox flying). A big thanks to the caller who rang, literally five seconds after the angry phone call, to say how much they liked that week’s show! Talk about really needing some encouragement and getting it at just the right moment. You may not realize it, but your calls and emails really make a big difference to me – Thanks, caller! Somewhere in between Wobbly's performance with John Oswald, and my performance with The Tape-beatles, for the 2001 Sound Unseen underground, film and music festival, I invited anyone with an interest in an improv session to join me in the studios at Radio K, where I was producing the show at the time. Wet Gate had not yet arrived, and while Oswald had expressed an interest in bringing his saxaphone, it was agreed that the improvising to be done was to be of the recycled-media variety (though I sometimes wonder what the CD might have sounded like with John Oswald on saxaphone!). We wanted to wait until Wet Gate were in town, but Wobbly would have been gone by then, and it wasn't clear if there would have been enough time, based on everyone's schedules, so Lloyd Dunn and John Heck (The Tape-beatles), Steev Hise, Jon Leidecker (Wobbly) and myself (Escape Mechanism) all got together to play. I remember the day quite well. 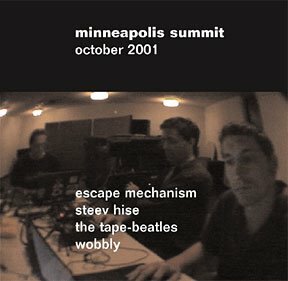 The Tape-beatles put together a little website for the resulting CD, where they got to tell their memories of the event, so this is my opportunity, I guess. I was the Production Director at Radio K, at the time, and was pretty knowledgable about how to write and produce underwriting announcements and promotional spots, but when it came to how to set up a live "band," as it were, in Studio One (which was technically one of my duties as PD), I was pretty lost. Of course, as I had done the inviting, everyone was pretty much looking to me to guide them as they set up their equipment, and I eventually had to go and find our station engineer, Larry Oberg, who saved the day, without complaint, by answering some basic questions about the set-up of the room. I was used to playing with two mini-disc recorders (with Gregg Boullosa and Corey Hansen on samplers and turntables), when we would be asked to play out live (as Cast of Thousands with Escape Mechanism), so I just set up those same units, with a stack of mini-discs, at the ready. Wobbly's set-up was the same one used at his performance at the Bryant Lake Bowl (later that night), while Steev, Heck and Dunn all used their laptops as instruments. We'd all done similar performances in the past, with a variety of different set-ups, so this was no giant step for any of us; but I have to say, having heard a lot of such recordings, that the results were definitely above average. We boiled the session down to about three takes (one long and two short) and spent a couple months after the festival, emailing little changes and mailing CDs around the world. We eventually decided to submit an edit of the longer piece to Staalplaat for consideration, and were excited when they decided to put it out. The Tape-beatles were in charge of the album art, and Steev and Wobbly did most of the final edits. I basically just sat back and watched, with my fingers crossed, hoping someone would want to do something with it. After having contributed my input to the actual recording, while successfully (or: miraculously) engineering the session, I just breathed a big sigh of relief and trusted them to take care of it from there. Of course, they did a fantastic job. A funny story, which the rest of the guys probably don't know, about the recording of the session: As we were setting up, Radio K was having a manager's meeting in the main office. As a student staff member, I was expected to be at the meeting, and since a number of people had seen me in the building, I couldn't exactly call in sick. So, I made it down to the meeting, a bit late, and very distracted, and received a lot of dirty looks from people who didn't know, or understand, that I was right in the middle of a once in a lifetime recording session with some of my favorite sound collage artists, from around the world. I had to make a decision about who I was going to annoy more - should I leave the guys down in the studio, wondering where I am, or do I bail on the meeting, making a bad impression on my bosses and co-workers? I ended up excusing myself early, to tend to the mix. It was a risk, but I was very excited to be working with Wobbly, the Tape-beatles and Steev Hise. Alright, next post: People Like Us, and Sound Unseen: 2002! 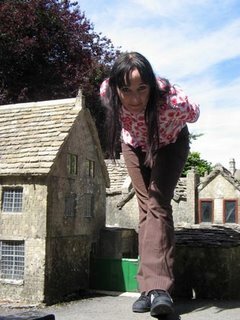 We had a day off after Oswald and Wobbly's show and I can't remember if I did anything at all that day. I'm sure there were a lot of great films to be watched at Sound Unseen and thats what we were all doing. We'd spent the afternoon prior to Monday evening's show, in the studio, recording a live mix, improvised together - but I'll save that story for the next post. Wet Gate arrived the day of their show, and Steev Hise opened for them at the Bryant Lake Bowl, Wednesday, October 3rd. The photo is of Steev performing in front o f a live projection of the computer screen he's using to monitor his manipulation of the various hardware/software which he uses to perform. Steev's work is often as much about the tools he uses (many of which he created himself), as it is about the message (not to mention the joy of listening). At the time of this performance, Steev was performing with something he calls The Syntagm Engine, which is, as he says on his website, "an attempt to solve the following problem: How does one combine a performative practice of non-idiomatic free improvisation with an aesthetic of critical sound collage (critical in the sense of detournement, the removal of a piece of culture from its original context and its placement in a new context with the purpose of commenting on or critiquing that material or its origins)?" Steev is the sysadmin of Detritus.net, by the way. I have no idea what sysadmin means, except that you see "sysadmin" used a lot more than "Systems Administrator," which is what I assume it stands for. Regardless, the site he administrates is awesome. Detritus.net is a website dedicated to recycled culture, which Some Assembly Required and most of my recycled art projects have been pretty closely associated with for more than a few years now. I think the first Escape Mechanism website was hosted there in 1999, so thats about six years anyway. 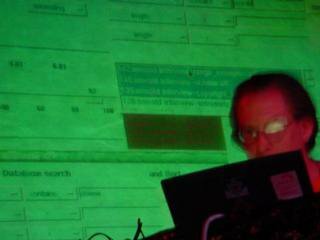 The photo is not from his performance at Sound Unseen; its from his performance at Electrofringe 2001, in Australia. It looks exactly like what I remember though, from his opening set for Wet Gate, so I stole it from his page at Detritus, and used it here. There's no photo that would really do Wet Gate's performance justice. They have the same problem with audio recordings from their live performances. You really have to see the explosion of light, color and sound, recycled from the film they're simultaneously projecting/manipulating, in person, or you're not really going to get it. Not really. Wet Gate went on after Steev, with their three film projectors looking very reminiscent of the Tape-beatles set up on Sunday, but once the peformance began the differences became quite clear. For one thing, while the Tape-beatles were "performing," in the sense that they were physically monitoring and manipulating the speed at which the film was projected (in order to keep the three screenings playing approximately in time with another), when Wet Gate performed with their sixteen millimeter film reels, they were literally creating something new right there in front of you - improvising as much with the projected light, as with the images on the film, at the same time they were manipulating the soundtracks to the same source material (using small samplers, connected to the projectors). It was nice to start the series with the Tape-beatles, and end with Wet Gate, for this reason. 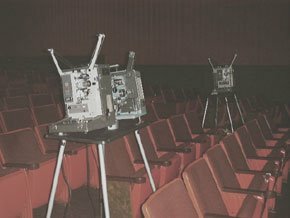 Here were two groups, whose film projectors were often used to define them, proving that it was how they chose to use those machines, along with their choices of projected sounds and images, which really defined their work as individual artists. It was a beautiful close to a wonderful series of Plunderphonic events, and I was really really proud to have been a part of it. The next day at the Walker Art Center, Kembrew McLeod led a little discussion with The Tape-beatles, Wet Gate and Steev Hise, and all I can remember is that it was absurdly short. The group had only just started to warm up to the idea of having a discussion on a stage, when someone stepped in and said ok, thats all the time we have. There couldn't have been more than a 1/2 hour between their introductions and their thank-you's. But who can complain? We'd had three great evenings of excellent performances by six very different groups, united in their re-use of previously existing audio and video/film, and at least one very good recording resulted from having gathered so many like minds in Minneapolis. I will tell that story next. By the way - now's a good time to say thanks to Nate Johnson for asking me to organize the shows! I really can't thank him enough for giving me that opportunity. Thanks Nate! Its all coming back to me now. I've organized a few shows since, and its not really as exciting as it used to be, but that first one - three days at the Oak Street and Bryant Lake Bowl, meeting so many artists I admired - was really very exciting. I had taken about a week off of work and just spent the entire time arranging shows or hanging out with the artists. I just wish I had taken more pictures! After the Tape-beatles performance at the Oak Street on Sunday, October 30th, we were all pretty excited to see Wobbly perform with John Oswald at the Bryant Lake Bowl - the next day. I pretty much knew exactly what to expect from Wobbly, having played his live recordings on Some Assembly Required, but I had no idea what John Oswald was going to bring to the table. Plunderphonics is Oswald's term, by the way, pretty much exclusively. Though of course, like so many words, its becoming a part of the vernacular (like xerox, or bandaid, which were originally words used to describe specific products - we now use these terms to describe many similar products). We had a very interesting email dialogue about the history and definition of the term, in preparation for his appearance at the festival - and he did give us permission to use it as loosely as it was applied to this series: as an umbrella title for what all the sound collage artists (Tape-beatles, Escape Mechanism, John Oswald, Wobbly, Wet Gate and Steev Hise) were doing. It makes sense, from the perspective of plunder=to appropriate, and phonics=sounds, as we all are all taking (appropriating) sounds from the media environment, to create new compositions. 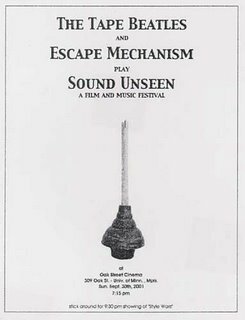 Historically, however, as Steev Hise put it so well in his introduction to the Plunderphonic section of that year's festival, "Plunderphonics," as John Oswald intended the word to describe his own work, refers to creations which utilize obvious "sonic quotes" from the previously recorded work of ONE specific artist at a time. So, say I sample three or four seconds from each of the 12 tracks found on DJ Food's "Kaleidoscope." The resulting sound collage would be "Plunderphonic." However, if I took that collage and added samples from the Avalanches, Big City Orchestra and Cut Chemist, the resulting work would be a composition which Oswald referred to as POLYplunderphonic - as it samples from more than one artists work. That night, Oswald took the stage first, and we were all treated to a rather dramatic presentation on Plunderphonics, by way of versions of his 1993 release, Plexure. The theater was almost completely dark as he lectured, and a very subtly evolving projection of a photocollage shifted silently behind him as he alternately spoke, answered questions and presented examples of his work. Wobbly went on right afterward, with the polar opposite of Oswald's presentation, in tone. Brightly lit and at a break neck pace, he pounded through a spectacular performance of his Wild Why composition, using three small commercial samplers, whose blinking "red buttons" were fondly admired by the Tape-beatles, et al, after the show. There was a feeling of revelrie afterwards, as The Tape-beatles, Wobbly, John Oswald, Steev Hise and myself (joined by Kevin Karpinski, who had been shooting footage of the festival) took to the lanes next door at the Bryant Lake Bowl (the theater space and lanes are all part of the same small complex on Lake Street, here in Minneapolis). 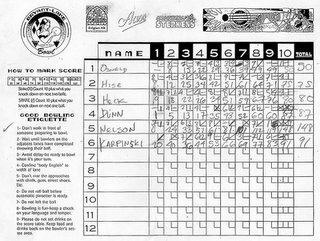 Some of us bowled barefoot, and we all drank beer, completely oblivious to the fact that the ball rack was slowly, but surely, overflowing. It turned out someone was sampling a new ball with every throw! How appropriate. Here are some photos, taken by the Tape-beatles, of our bowling match. 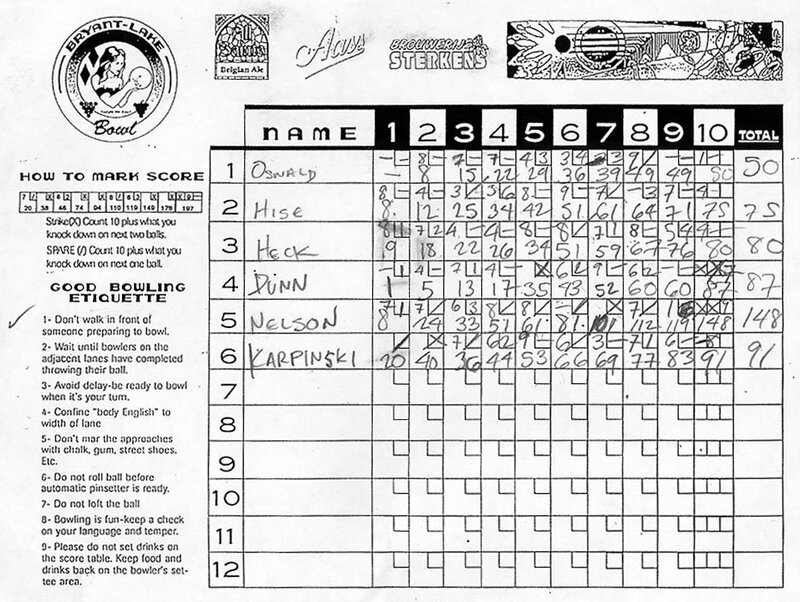 I was the only one trying, apparently, as the scorecard seems to indicate. 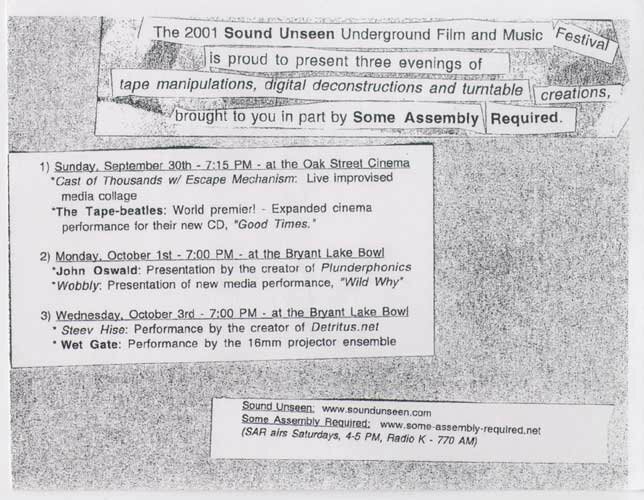 Two events down, two to go (from 2001's Sound Unseen). Tune in next time. Thanks for reading! I mentioned Mark Hosler came to Minneapolis to give his lecture/film presentation on Negativland in 2005. I've tried to bring a sound collage artist of note to the Twin Cites at least once a year, and have sponsored a few related events along the way as well. It all started in 2001, with the 2nd Annual Sound Unseen Underground Film and Music Festival. Nate Johnson (the festival's founder) contacted me in 2001, to ask me to curate a section of his festival. He was very interested in Plunderphonics, and the artists I play on Some Assembly Required and wanted me to put together a sort of side-show for his 2nd annual festival and, of course, I was more than happy to oblige. 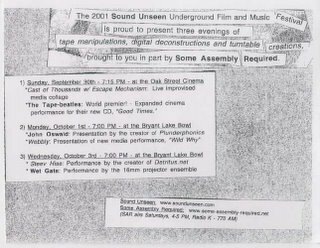 So, in September of 2001, we presented the world premier of the Tape-beatles expanded cinema performance for "Good Times." Escape Mechanism opened the show with our final performance as Cast of Thousands with Escape Mechanism. That was a huge thrill. There were an awful lot of people at the Oak Street Cinema that night (including John Oswald - who would make an appearance later that week). "Good Times" was breathtaking and the crowd really dug it. 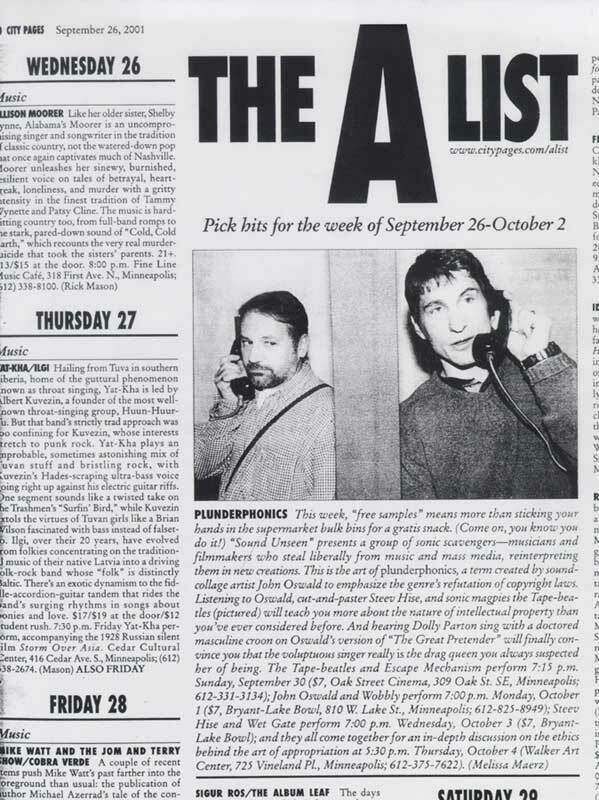 It was an awesome way to kick off the Plunderphonics section of the festival, and it even made the City Pages A-List, that week. I'm going to see if I can't finally figure out how to move photos into position around specific comments with this post, even if it appears that there is no way to title them... T his is a photo apparently taken by the Tape-beatles, at the Oak Street Cinema, of the three film projectors utilized in their Polyvision, or Expanded Cinema, presentation of Good Times. Did I mention it was the world premier? Yeah, we were pretty proud of that fact. So, Lloyd Dunn and John Heck each flew to Minneapolis with all of their gear from Prague, where they are currently living (They're both originally from Iowa, just one state away from Minnesota - a fact noted with chagrin, by Nate, when going over the travel budget!). Oswald had flown in from Canada that day (Sunday), basically just in time to see the show, but Dunn and Heck had arrived the day before, along with Jon Leidecker (Wobbly) from California, and all three of them joined me on Some Assembly Required. That was the first time I'd ever done a live interview with an artist (or group of artists). I nearly always pre-record and edit the many interviews I've done with sound collage artists for the show. So that was a very exciting weekend for me. I'd known Lloyd Dunn and Jon Leidecker for some time prior to the event, but this was the first chance I'd had to meet them in person. Actually, thats not true - I forgot about a road trip I took to Chicago to see the Tape-beatles at the Empty Bottle. I'd gotten notice that they were performing nearby (My old stomping grounds are only about 6-8 hours away, depending on how strictly you follow the posted speed limits), and decided to go and see them perform. It was a smoky bar, but well attended and it was pretty cool to see, I think it was Grand Delusion, live, as presented by the band themselves. I literally drove down, saw the show and went right back up to Minneapolis. I suppose thats pretty common for people who live to see shows, but I rarely do something like that. I didn't even have time to look up any old cohorts. The only person I saw was a guy named Eric, who used to be projectionist at the Music Box Theater, where we both worked back when I lived there. No surprise to see someone so serious about film at such an event! While they projected onto a large white bedsheet at the Empty Bottle, their performance at the Oak Street marked the first time they'd ever given a film presentation in an actual movie theater. A nearly sold-out show, in late September, with the smell of fresh popped popcorn... Gregg, Corey and I having just wrapped up our final set as a band... I remember sitting there watching the show and feeling very happy. Some of my favorite memories are in old movie theaters like the Oak Street. Dunn, Heck, Leidecker, Oswald and I all went out for pizza after the show, with some friends of theirs, to Pizza Luce on Lyndale Avenue. Good Times, indeed! Oswald and Leidecker were to take the stage next, at the Bryant Lake Bowl, the very next day... But, I think I'll move on to the other shows in another post. I think I've gone on long enough for this one. thanks for reading!